ST. GEORGE — The lifespan of a hamburger is usually measured in minutes: You get the burger, you scarf the burger, the burger is gone forever. A man from St. George, however, claims that he has a 14-year-old McDonald’s burger that still looks like new. David Whipple said he purchased the burger July 7, 1999 in Logan in order to use it for a demonstration about enzymatic action. He was battling with his weight and was going to show it to a group of fellow weight loss advocates. He let it age for a month and showed it to the group. “At the little meeting, I showed the hamburger and the pickle, which was just starting to disintegrate,” Whipple writes. “There was no decomposition to the meat or bun, nor any mold, fungus or smell. It had no bad odor at all. The burger, which he says was stuffed into a jacket pocket and tossed into his truck after the meeting, was forgotten about, surviving the summer heat. It was discovered a year or two later in a closet, still in the coat pocket with the original bag and receipt. “It was purely a fluke about hanging on to it,” Whipple said in an interview with ksl.com. The burger had only a pickle, mustard and ketchup on it, no lettuce or cheese. 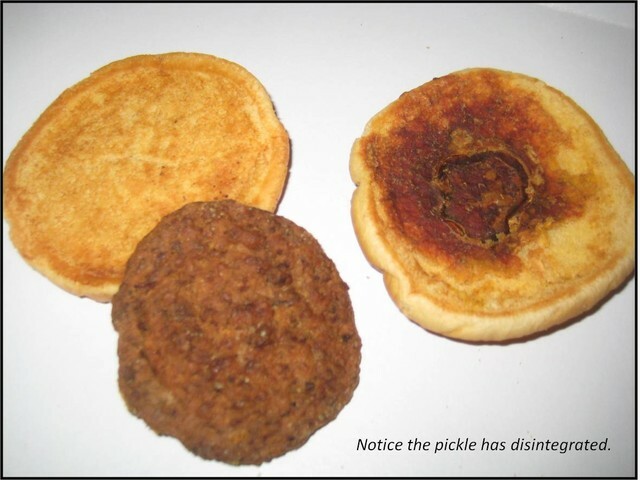 Only the pickle appeared to decompose much over the years. It also survived a move from Logan to St. George, where it was discovered in a box in 2007. Whipple even tried selling it on eBay, where it reached about $2,000, but never sold because his daughter bid on the item. He said it’s never been refrigerated or stored in a way that would preserve it. Eventually, he started a blog where he wrote about the burger and periodically posted pictures. Recently, the burger was featured on the television show “TV Doctors.” On Tuesday, the burger went viral. “This just came out in the last couple of months and it’s just been crazy,” he said. Whipple said he isn’t sure why it survived so long and can’t attribute it to either dehydration or chemical preservatives or something else. “That’s the million-dollar question. They dig up things in King Tut’s tomb,” he said. He’s also performing a more controlled version of the experiment on cheap burgers from several other burger joints, and so far the results are pretty similar to the accidental one. “I still got them sitting here, and there’e all hanging out really well. They’re doing just fine, just about like the 14-year-old burger does,” he said. Whipple said he thinks the burger’s example has had a positive impact on his family’s eating habits.